Ransomware encrypts all your files using strong unbreakable encryption. The attackers then ask you to pay them to decrypt your files. Usually payment is via bitcoin. 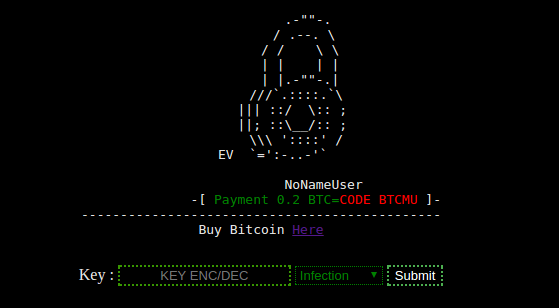 Bitcoin gives the attackers a way to create an anonymous wallet into which the ransom can be paid. Ransomware has been around for a long time. It originally dates back to 1989 with the “PC Cyborg trojan horse virus” that would extort its victims into sending $189 to a PO Box in Panama to get their files decrypted. The encryption on that virus was easily crackable. This year we have seen ransomware attacks on a scale that would have been hard to imagine several years ago. In May of this year, the WannaCry ransomware attack affected hundreds of thousands of people in over 150 countries. The UK National Health System was affected and had to divert ambulances away from affected hospitals. In June we saw the Petya (eventually dubbed NotPetya or Netya) ransomware rapidly spreading, starting in Ukraine. A large number of high-profile organizations were affected, including Ukraine’s state power company, the Chernobyl nuclear reactor, Antonov aircraft, shipping company Maersk and food giant Modelez. Today a large number of affected people and organizations actually pay attackers when they are hit by ransomware, and sometimes their files are successfully decrypted. Security organizations, including the FBI, generally advise customers to not pay attackers because this encourages the spread of this kind of attack. However, many organizations simply do not have the option of not recovering their data – and so they pay, which perpetuates this criminal business model. Most ransomware targets Windows workstations. However, the Wordfence team is currently tracking an emerging kind of ransomware that targets WordPress websites. For each directory that the ransomware processes, it will send an email to “htaccess12@gmail.com” that informs the recipient about the host name and the key used to perform the encryption. When the encryption process starts, the ransomware creates two files in its installation directory. The first is named “EV.php,” a file containing an interface that is supposed to allow the user to decrypt their files if they have a key. This file contains a form, but it does not work because it does not include decryption logic. This ransomware provides an attacker with the ability to encrypt your files, but it does not actually provide a working decryption mechanism. It does, however, give attackers what they need to trick affected site owners into paying a ransom. Their only goal is to encrypt your files. They don’t actually have to prove they can decrypt your files to get you to pay a ransom. If you are affected by this ransomware, do not pay the ransom, as it is unlikely the attacker will actually decrypt your files for you. If they provide you with a key, you will need an experienced PHP developer to help you fix their broken code in order to use the key and reverse the encryption. 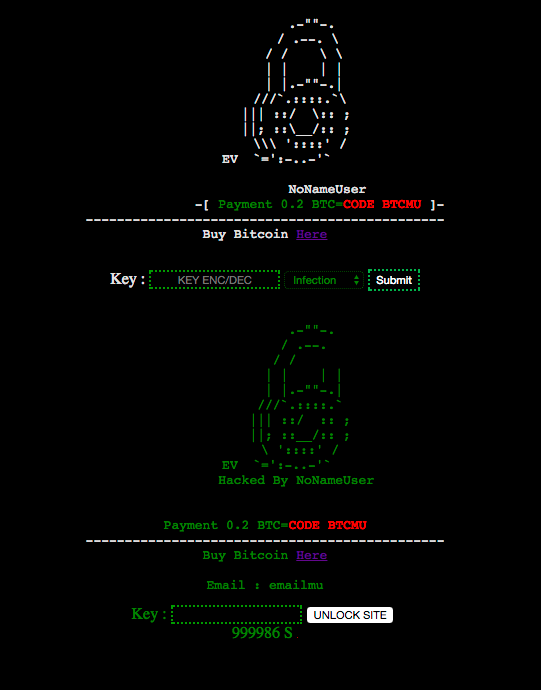 This ransomware was first seen by Wordfence being used in a single attack attempt on July 7th. We released a malware signature to our Premium Wordfence customers on July 12th that was specifically designed to detect this ransomware and any variants. That means our Premium customers’ firewalls have been blocking any attempts to upload this ransomware since then. The Wordfence scan also has detected the presence of this ransomware for Premium customers since July 12th. 30 days later on August 11th, this rule became available for our free community customers. If you are running Wordfence Premium or Wordfence free on your websites, you are currently protected against this attack. Wordfence will protect you from being hit by this in the first place. We also recommend that you have reliable backups. It is important that you don’t store your backups on your web server. If, for example, they’re stored in a ZIP archive on your server, then if your site is taken over by this ransomware, the backups will also be encrypted and will be useless. Your backups should be stored offline, either with your hosting provider or using a cloud storage service like Dropbox. The earliest variant of this ransomware appeared in May of last year on Github. Version 2 of the ransomware is what attackers are currently using. The first time we observed this ransomware being used in the wild to target WordPress websites was last month. The function above determines whether it should exclude a file from encryption, so the word ‘except’ makes sense in this context as an Indonesian function name. When you load the ransomware, it loads a YouTube video which is invisible, but you can hear the audio playing in the background when you view the ransomware user interface. The video plays an Indonesian rap tune and the lyrics appear to mention hacking. The title of the video is “ApriliGhost – Defacer Kampungan.” If you look up @aprilighost on Twitter, you find this account, which links to this Indonesian Facebook account. ApriliGhost may not be the attacker, but the video is Indonesian in origin – a further Indonesian connection. Another clue is that the ransomware seems to be connected with the website errorviolence.com. When you view the ransomware in a web browser, after a certain amount of time it will redirect you to that site, which is an Indonesian hacking forum and website with resources for hackers. Our attack data has logged related attacks from IPs with the location of Jakarta, the capital of Indonesia. We have seen related attacks originating from several other non-Jakarta IPs, but these do not resolve to any specific location, but rather to organizations that may be used to proxy attacks. So far, Jakarta is the only location with a clear link to these attacks. Conclusion: This ransomware was created in Indonesia, probably by bug7sec, and used by at least one Indonesian-based hacking group, from Indonesia, to target WordPress websites. The EV ransomware that we have documented above is incomplete, in that the decryption function does not work correctly. It does work well enough to extort money from unsuspecting website owners, although we have not yet received any reports of extortion taking place. So far we are only seeing attempts to drop this ransomeware on WordPress websites. We expect this to evolve over the next few months into fully functional ransomware that targets both your files and database in WordPress. We also expect to start seeing incidents of extortion. For websites that do not have a firewall like Wordfence and regular backups, this may turn into a profitable business for attackers who can ransom a few thousand websites. So far, attackers targeting WordPress have earned money only indirectly from compromised WordPress sites through techniques like email and SEO spam. Major vulnerabilities in the WordPress ecosystem emerge from time to time – for example, the defacement campaign that the WordPress community experienced earlier this year. The next major vulnerability may see attackers switching from older business models to using ransomware to directly monetize compromised WordPress websites. As I mentioned above, Wordfence has been blocking this ransomware for our Premium customers since we first saw it used in an attack in early July. I strongly recommend that you install Wordfence Premium to protect yourself against these kinds of threats. In September of last year, Wordfence integrated our malware scan into our firewall. This allows Wordfence to use malware signatures that we create to recognize files like this ransomware variant in our firewall. By using this technique, Wordfence will block an attempt to upload ransomware, even if the attacker used an unknown exploit. To get the most benefit from Wordfence, I encourage you to upgrade to Premium. Not only do you get your firewall rules in real time, but you also get our malware signatures in real time from our team. In this case, you would have been protected from this new ransomware detection for over a month already by now. An additional layer of protection against a ransomware attack is to ensure that you have good offline backups. Make sure your backups don’t live on your web server. They need to be backed up to a separate server or a cloud storage service like Dropbox or Google Drive. Keep in mind, though, that your backups are your last line of defense. It is better to avoid getting hacked in the first place. I hope you have enjoyed this detailed post on ransomware and how it is beginning to target WordPress. If you have any questions or comments, post below and I will be around to reply. Thank you to Pan Vagenas for his research which contributed to this post. Also thanks to Andie La-Rosa and Dan Moen for their assistance editing this post. 47 Comments on "Ransomware Targeting WordPress – An Emerging Threat"
I have a question. Can this affect the database or is this just affecting the core and content files? The version we discuss in this post only affects files. My guess is you'll see ransomware targeting the DB within a few months. It's such an obvious high value target. Probably the wp_users table would be the first thing to go after - encrypting just the email column would be very destructive. A site would essentially be disabled and have no way to communicate with customers until the ransom is paid. Thanks, that's when I would really be concerned files I have backed up. Does word fence have a db backup in their premium service? We do not. Check out Updraft Plus. Great detective investigation. Thank you for keeping us free subscribers safe. Your are worth your premium fee and i will upgrade when my business starts to grow. How do they compromise the Wordpress site in the first place? Are they circumventing the password? Attackers usually target a vulnerable theme or plugin in the WP site. Once they're in, they'll drop the EV ransomware payload and encrypt your files. The next time you visit your site, you see the ransomware page appear. 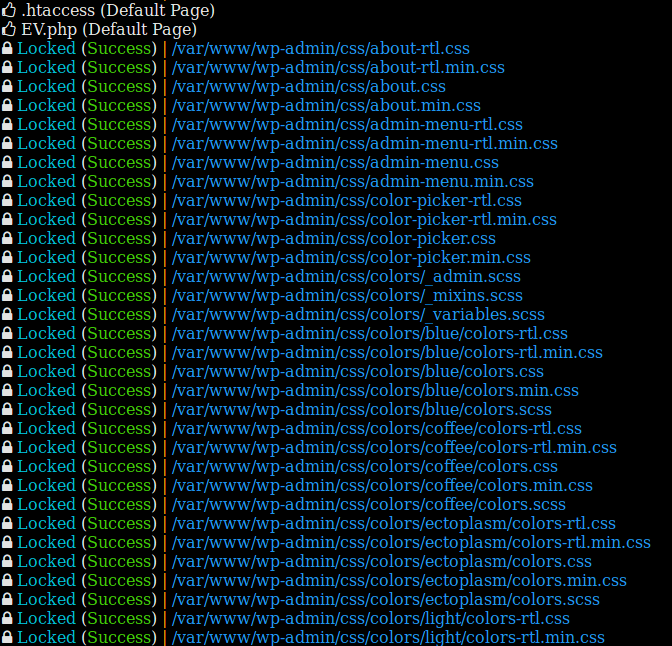 We have been running back-ups via GoDaddy Managed WP + use WordFence. If we selected a plugin (back up buddy, for instance) that saved copies of the site to, say, Drop Box, would that be compromised too? Do we need to take back-ups onto our desktop computers to be immune from this crime? Thank you for your services. I'm an IT newb, having just started in March 2017. In general backing up to dropbox will give you a way to restore your site if you are hit by ransomware. It maybe feasible for ransomware to access the dropbox files via your backup software and corrupt past backups. That is feasible if your backup software has read/write access to past backups and the ransomware steals those credentials and accesses your dropbox files. I've never heard of this ever happening - but in theory it's a possibility. Ideally you want to take past backups completely offline and have them be completely inaccessible to the system that was backed up. Thanks for including the defense in all versions of Wordfence. Isn't there something someone can do to head this off at the pass, before it is developed into a worse attack? Isn't it possible to remove entire WP installation and then install a fresh one from backup? It sounds like simpliest remedy, am I missing something there? Sure, that's true for anything. And it's a great theory. Windows workstation infected? Blow it away and restore from backup. One has to wonder then, why ransomware has had such a severe impact world-wide during the past year. It's because it isn't that simple in reality. Sometimes backups don't exist, aren't available, are useless or are corrupt. Sometimes systems have real-time data that becomes inaccessible and didn't get picked up during a 24 hour backup cycle. Sometimes it's really difficult to find someone who has any idea how to restore your backups. Checking the "backup box" is easy. Actually recovering from an incident is hard. Very few organizations have regular backups where they verify they can restore those backups, regularly. When last did you do a test restore of your backups? Have you ever? How much data would you lose if your site was hacked right before the backup ran? Would it be possible for an attacker to disable your backups or tamper with them? So, what's the problem if it only affects files? Reinstall (from a backup), close the vulnerability, done. Encrypting (parts of) the database would be disastrous, but this is only a minor problem. If you don't have backups and are e.g. an image hosting website, all your assets are encrypted. Plenty of sites have valuable intellectual property in the form of files. Losing access to that would be disastrous. Is this limited to Windows servers or are Unix server installations running Wordpress also vulnerable? Most WordPress websites are hosted on Linux servers. Some are hosted on Windows servers. Whether you are hosted on Windows or Linux, you are vulnerable to this if you are infected. This is just another reason why snapshots using ZFS are a must! That way one can just rollback the files like this never happened with a single command. I totally agree with having backups off server. If one must perform this on the same server at least make sure backups are done using a different Linux/Unix user account than what the website is running under. That way if the files are encrypted the backups shouldn't be encrypted since the web server user won't have write permissions. Still better if one just backups off that server and ideally to another provider in another datacenter just in case. Thanks for the heads up. Running fresh backups now. Ever since Ransomware destroyed my family business in 2015, we've been struggling to rebuild and I always feared one day that Wordpress would be targeted outright. It's actually one of the reasons I moved to wordfence to help protect my websites. Thank you again for all the hard work you guys do. I was hit by a ransomware hack on my Wordpress websites in Feb 2016. Got into my hosting account and since I was ignorant of these attacks at the time and had a bulk account, I lost 25 websites. Client and personal sites. I was to pay $50 in Bitcoin, which I did and never received the decryption code. Sites were all gone. So rebuilt and found Wordfence to protect them. Also I have set a limit to 3 sites per hosting account now. Tough lessons learned. I'd love to get more data on what variant you were hit with. 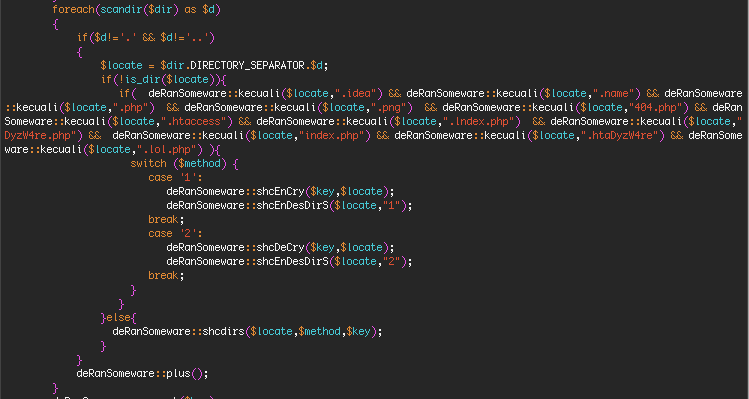 Ransomware is rare in the WP echosystem. At least it has been until now. Just another reason why we would never go without our Wordfence protection! Thanks guys! I had victims submit files to my website (ID Ransomware) from a variant of this using the extension ".lalabitch" a few weeks ago. I had acquired a sample of it then and everything matches your analysis as well. Awesome, thanks for sharing this Michael and for validating our findings. Drop me an email at mark at wordfence dot com if you have any other data to share. Much appreciated. Pardon the "newbie" question here, but if the directory and folders where the site's files live are password protected, would the ransomware still be able to infect said directories and files...? Yes. I'm going to assume you mean 'password protected with basic web authentication'. In that case, once the attacker has access to your filesystem directly, they are completely bypassing that. This is exactly why I host my clients' code on virtual servers I can control and prevent WordPress from being able to write to anything except the dedicated upload directories. Yes it's not nearly as convenient as the "click to update" features or the in-app file editor but it is much more secure. This should, IMO, be a very first step in security (the very next one being to install wordfence of course). I find it sad that something like this would come out of Indonesia as I actually have a lot of family and close friends from Indonesia. :-( But I would not be surprised much to find this kind of malware coming from just about any country. I guess that all that needs to happen is for the payload to sit dormant for 1 week or so , and then fire off, so even all the backups will contain the virus. This would make things harder that you cant restore from backups easily. So will the country blocking feature prevent these ransomware attacks? Do you have a list of IP's that you can share for the free wordfence users to add to their firewall? Our Premium product has an IP blacklist that is excellent at blocking about 90% of attacks. We don't have that service for free customers. Country blocking won't really be effective against this. It seems that the weakest point in WP is plugins. Do you have a list of vulnerable plugins so that as a web host I can monitor for them? Check out our monthly attack report - about 1 or 2 posts ago. Any idea what the at risk themes are? The usual suspects. Check out our monthly attack report for more info. I feel so fortunate to have found wordfence and signed up for the premium about a year ago. Everyday I've got people trying to hack in thru password recovery and now I have my sites locked down with the additional code on my phone to login with administrator logins. I'm sure it's only a matter of time before the find a way so I appreciate that you guys are driven to be one step ahead at all times. I don't think people understand the value of the premium for so little price of admission. I got infected with something a couple of years ago and my provider wanted to hook me up with a scan company that charged $700 per site just to scan. Nice affiliate gig if you can get it, lol. Thanks again so much Mark. You guys ROCK!!! Nicely summarized. Thank you for spreading the word so excellently. Exactly why we recommend WordFence to all our customers and client. Thanks for spreading the word. Thanks for the info! Definitely a good reason to keep up on backups.